Spend less time maintaining your bird bath and more time enjoying it by adding the CareFree Bird Bath Protector to it. This liquid effectively prevents stains, sludge, and mineral deposits from forming in your bath, helping it remain clean. Simply add a capful of this product to your bird bath on a weekly basis and mix thoroughly. Made from natural enzymes from plants, this protector will safely break down organic contaminants for a clean bath, and is safe to use with bird baths made from stone, copper, plastic, cement, or any other material. The food grade enzymes and bacteria free formula ensure there are no restrictions for the product when used as directed. 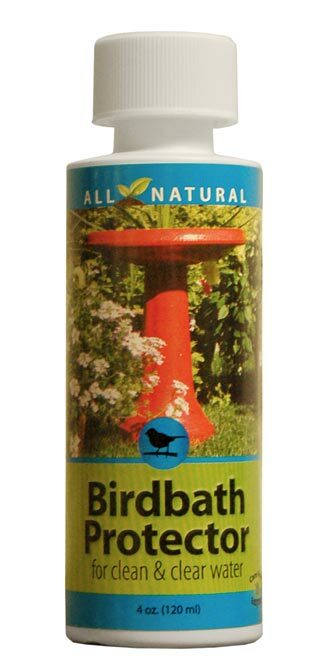 Keep your bird bath clear in an environmentally friendly way with this Bird Bath Protector. Made in the USA. Note: For best results, start with a clean bird bath.